Note: Not compatible with RaceCapture/Track MK1. Attach ShiftX3 with #6 mounting screws and tighten until snug. OBDII installation is effectively plug and play. 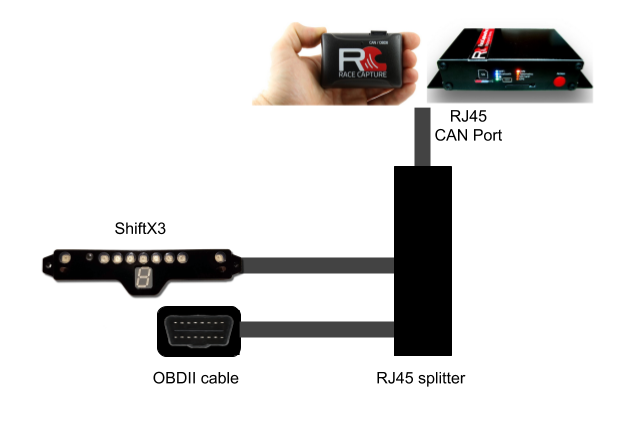 Power is supplied to both ShiftX3 and RaceCapture via the OBDII connection. 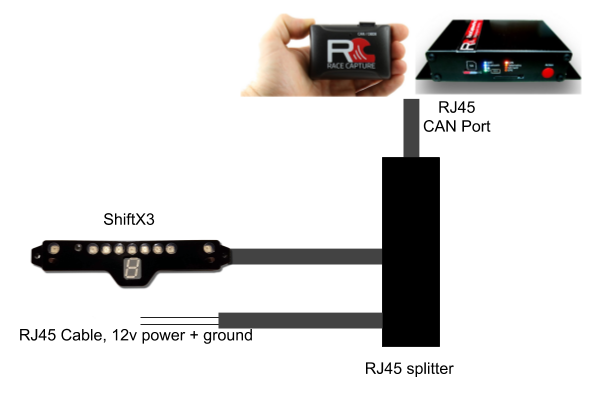 If your system is installed without OBDII, or you are using PodiumConnect or RaceCaptue/Apex, you can provide power to ShiftX3 and RaceCapture via a direct wire connection. 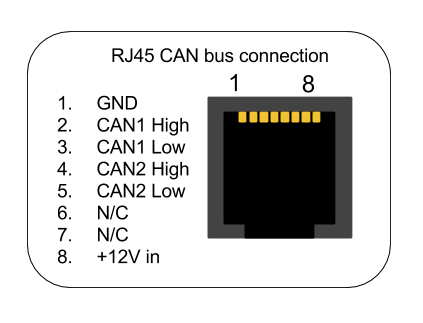 If you are powering RaceCapture/Pro directly via the main harness, this will not provide power back through the RJ45 connector, as isolation diodes are present within RaceCapture/Pro to prevent undesired back-driving of circuits. To power ShiftX3, you must provide external via the CAN hub using the technique below. 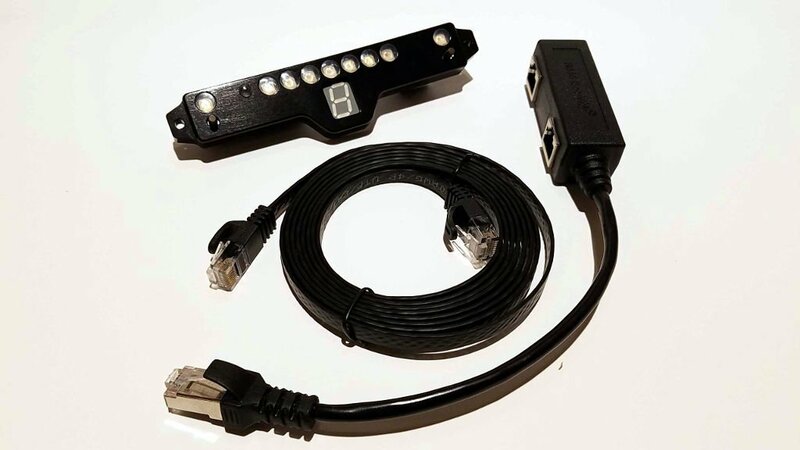 You can power RaceCapture/Track MK2 and ShiftX3 via the RJ45 cable connection described below. This also can power RaceCapture/Pro via RJ45 port, if desired. 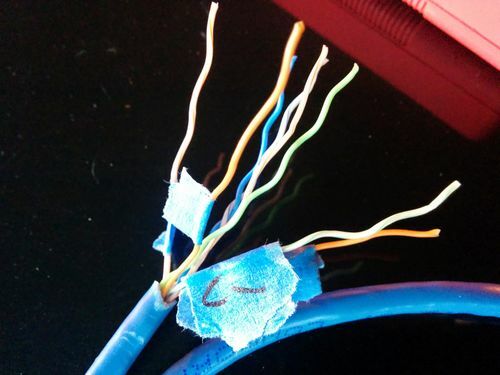 Start by snipping the RJ45 connector off the end of a patch cable, and then expose the individual wires. 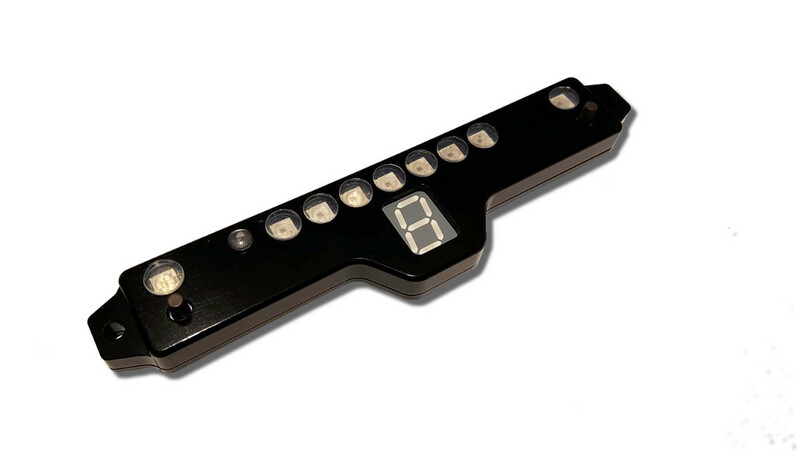 The LEDs and display on ShiftX3 are controlled by RaceCapture's Lua scripting capabilities. Built-in functions provide access to ShiftX3's capabilities. See the ShiftX3 Lua scripting reference for additional details. Note: Ready to go scripts may be available as a preset. 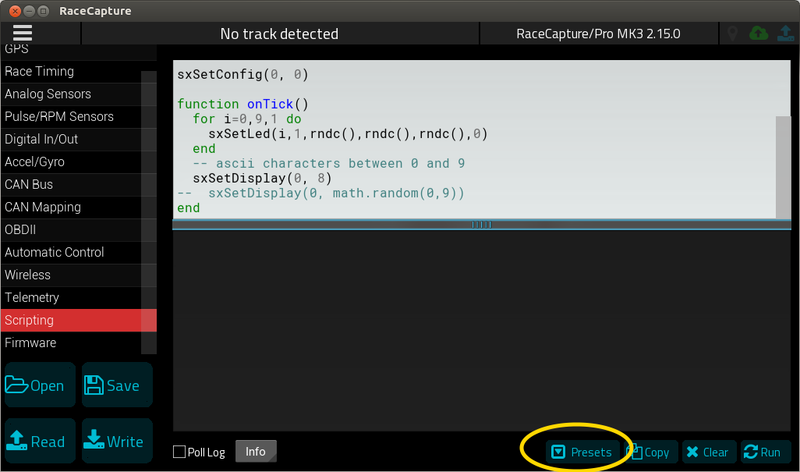 When in the Scripting view, press the Presets button to access a list of pre-configured scripts. Be sure to press the cloud update button to get the latest set of presets. Once ShiftX3 is powered and connected via CAN bus, the left and right ShiftX3 buttons will automatically trigger corresponding left and right navigation actions on the RaceCapture dashboard. The following scripts assume ShiftX3 is set to the default CAN bus settings. This is a test script that exercises all of the LEDs and the 7 segment display on ShiftX3. You can use this as a first time test, as it does not rely on any sensors. Available as a scripting preset - or you can copy and paste this entire script into the scripting window, replacing any existing script. This script will randomly set LEDs with different colors and the display will update with random numbers. This script configures just a sequential shift light, and update gear display. Default is reading RPM from the channel named "RPM"
Default is creating the Gear channel with the channel name "Gear"
Default is reading the Gear channel with the channel name "Gear"
This script shows a more complete example that demos a sequential shift light + two alerts + Gear indicator. Engine Temperature on the 1st alert LED, connected to first analog channel - channel name "EngineTemp"
Oil Pressure on the 2nd alert LED, connected to second analog channel - channel name "OilPress"
Gear channel already exists, named "Gear"
Gear channel already exists (provided by ECU) and is named "Gear"
MAP sensor is on the channel named "MAP"
The CAN bus API provides the configuration and control interface for ShiftX3. CAN termination is enabled by default. To disable termination, cut the CAN Term jumper on the bottom of ShiftX3 circuit board. The default CAN base address is 931328 (0xE3600). You can change it by breaking the trace bridging the ADR1 jumper on the bottom of the ShiftX3 circuit board. The default CAN baud rate is 500K. You can switch to 1MB by breaking the ADR2 Jumper on the bottom of the ShiftX3 board. 1 Automatic brightness scaling (Optional) 0-255; default=61. adjust this value to adjust the relative gain of the built-in light sensor when in automatic brightness mode. Directly sets the value of the 7 segment display. The value of the display is set by the ASCII coded value. To set a numeric value, offset the value by 48: e.g. 48 = 0, 49 = 1, etc. Most alphanumeric characters are supported as well, also via ASCII representation.